"How lend-lease strikes at the Axis," ca. 1940–45. Image courtesy of American Memory at the Library of Congress (From FSA Photographs). The Lend-Lease Act, approved by Congress in March 1941, gave President Franklin D. Roosevelt virtually unlimited authority to direct material aid such as ammunition, tanks, airplanes, trucks, and food to the war effort in Europe without violating America's official position of neutrality. By 1945 the Lend-Lease program had cost $49.1 billion, and over 40 nations had received aid in its name. Lend-Lease, like Social Security and other New Deal programs, proposed a vastly expanded role for the U.S. government, particularly the President. As he did in advocating other programs, FDR employed fireside chats, press conferences, and the State of the Union address to gain support for Lend-Lease. After the program was implemented, he even employed the same photography unit that had documented the Farm Security Administration to provide photographs to promote the program. This lesson shows students how broadly Lend-Lease empowered the federal government—particularly the President—and asks students to investigate how FDR promoted the program in speeches and then in photographs. This lesson presents the Lend-Lease program in the context of American domestic politics and foreign relations. It asks students to analyze the political "spin" surrounding the passage of the Lend-Lease Act, to examine photos of Lend-Lease materials sent to Allies, and to evaluate the role of America in world politics. The legislation establishing the Lend-Lease program gave President Franklin D. Roosevelt the power to sell, transfer, exchange or lend equipment to any country to help it defend itself against Axis powers. This was an extraordinary grant of power to the President. Not only did Congress give him the power to determine who received the aid, but the act also contained a broad definition of what constituted equipment, thus allowing FDR to decide that the term included anything from advanced weaponry to food to factories. The bill also allowed the President to increase domestic production in order to meet the defense needs of foreign countries. Roosevelt used this power in a dramatic fashion. Initially intended to help Great Britain, the Lend-Lease program was expanded within months to include China and the Soviet Union. Nazi Germany's invasion of the Soviet Union in June 1941 created an instant alliance between the Soviets and the two greatest powers in what the Soviet leaders had long called the "imperialist camp": Britain and the United States. Three months after the invasion, the United States began to give Lend-Lease support to the Soviet Union, ultimately contributing about $11 billion to their war effort. Roosevelt promoted the Lend-Lease operation as he had once promoted New Deal legislation. He used folksy analogies at a press conference; he featured it in a State of the Union address; he used a fireside chat to help sell the program to the American people; and he had photographers from the Farm Security Administration turn their photographic talents toward documenting and thereby promoting the program. In support of Lend-Lease, Roosevelt coined the phrase the "Arsenal of Democracy." He asserted that the United States should not be neutral in the world, but, while still keeping U.S. troops at home, it should assume an active role in arming and supporting countries that were actively defending democracy. In this way, FDR gained the authority to extend material support to foreign nations as he chose, though with Congressional oversight. The Lend-Lease Act dealt specifically with the Axis powers; however, it also established a precedent of expanded presidential power in international politics and the military. Future presidents, from John F. Kennedy in Vietnam to Ronald Reagan in Iraq, would continue to exercise the power to provide military and other forms of support to nations threatened by anti-democratic forces. A brief overview of Lend-Lease in the context of Franklin D. Roosevelt's relationship with Winston Churchill is available at the EDSITEment-reviewed National Archives site. A one-page discussion of FDR's foreign policy prior to World War II puts Lend-Lease into context. It makes good background reading, linked from EDSITEment's Learner.Org. A quick overview of the Lend-Lease aid to the USSR is available from EDSITEment-reviewed American Memory. Historian Robert Dallek discussed the Lend-Lease program and the "garden hose" analogy that plays a significant role in Suggested Activity Two, linked from EDSITEment's Learner.Org. Since this lesson draws upon photographic evidence in Activity 3, the site Making Sense of Documentary Photography, from the EDSITEment-reviewed History Matters site, is worth reviewing, particularly if you do not often use such evidence. If you're interested in learning more, this scholarly article provides some extended background information. For an article discussing how FDR promoted his war aims in much the same way that he promoted New Deal programs, see: Richard W. Steele, "The Great Debate: Roosevelt, the Media, and the Coming of the War, 1940-1941," The Journal of American History 71, no. 1 (June 1984): 69-92. The December 17, 1940 press conference introducing Lend-Lease, in which FDR explained the program with his famous garden hose analogy, is available on the American Presidency website, linked from the EDSITEment-reviewed site History Matters. The December 29, 1940 “Arsenal of Democracy” Fireside Chat (entitled "On National Security") is linked from the EDSITEment-reviewed site the New Deal Network. Finally, the photograph collection used in this lesson is from the EDSITEment-reviewed site American Memory. Review the lesson plan and the websites used throughout. Student launch pads accompany activities one and two. There is a PDF for activity three. The December 29, 1940 "Arsenal of Democracy" Fireside Chat entitled "On National Security"
Main page for the photograph collection used in this lesson. Students can access this activity either through a LaunchPad. This activity focuses on the expansion of executive power involved in the Lend-Lease program. Students begin with a letter Senator Arthur H. Vandenberg wrote 10 months before Congress began deliberations on the Lend-Lease legislation. In the letter he expressed the fear that the executive branch would gain enormous power if America entered the Atlantic or the Pacific war. Students should read this letter alone or in pairs, noting each fear or objection Vandenburg raised to the prospect of America joining the war against Germany. Once students have finished reading, go over their lists as a class, creating a "master list" from their answers. As a class, categorize each objection as relating either to money or to loss of freedom (nearly all of his objections will fall into these categories). Conclude by telling students that many Americans shared Senator Vandenburg's reluctance to enter war against Germany at this time. Ask students to help you contextualize these fears given domestic and world politics of the 1930s. Be sure to mention the Great Depression, the rising number of dictatorships in Europe, and the controversial growth of government power during the New Deal as factors in shaping Senator Vandenburg's, and the public's, fears of joining the European war. In my opinion, if we are drawn into the world war—whether through Atlantic or Pacific hazards—we shall swiftly surrender to the equivalent of military dictatorship ourselves and we shall come from the conflict (no matter how victorious) into bankruptcy. No one can study the mobilization plans which are ready and waiting in the event of our entry into war—no one can study the vast emergency powers which the President can immediately exercise—without shuddering at their net effect upon American freedom. Meanwhile, no one can contemplate what it would mean in terms of money—if we were to add the pyramid cost of even a little war to our present debt burden which already crowds the statutory limit—without realizing that national bankruptcy would follow in the gloomy wake of our participation in any of these conflicts. All of this, furthermore, is entirely secondary and subordinate to the fact that an overwhelming percentage of the American People (regardless of their sympathies) insist that we shall never export another American soldier. I am opposed to American participation—directly or indirectly—in any of these wars; and since I do not intend to take "the last step" in this bloody direction, I also do not propose to take the "first step" or any other step which would lead in this direction—unless and until the American national interest has to fight for its own existence. Nine months after Senator Vandenberg expressed his concerns about federal, and particularly executive, power growing out of American involvement in a war, America moved closer to involvement in the European conflict. President Roosevelt proposed helping out Britain and other foes of Germany and Italy by lending them the weapons they needed to fight the war. Here, in this press conference, he introduces what became known as the "Lend-Lease" program. Well, let me give you an illustration: Suppose my neighbor's home catches fire, and I have a length of garden hose 400 or 500 feet away. If he can take my garden hose and connect it up with his hydrant, I may help him to put out his fire. Now, what do I do? I don't say to him before that operation, "Neighbor, my garden hose cost me $15; you have to pay me $15 for it." What is the transaction that goes on? I don't want $15—I want my garden hose back after the fire is over. All right. If it goes through the fire all right, intact, without any damage to it, he gives it back to me and thanks me very much for the use of it. But suppose it gets smashed up—holes in it—during the fire; we don't have to have too much formality about it, but I say to him, "I was glad to lend you that hose; I see I can't use it any more, it's all smashed up." He says, "How many feet of it were there?" I tell him, "There were 150 feet of it." He says, "All right, I will replace it." Now, if I get a nice garden hose back, I am in pretty good shape. In other words, if you lend certain munitions and get the munitions back at the end of the war, if they are intact—haven't been hurt—you are all right; if they have been damaged or have deteriorated or have been lost completely, it seems to me you come out pretty well if you have them replaced by the fellow to whom you have lent them. I can't go into details; and there is no use asking legal questions about how you would do it . . . .
Have students read this selection and "map" the analogy fully. FDR, in this illustration, owns the garden hose. Who is his neighbor? What is the fire? What is the fire hose? Why might it get smashed up? How well does this analogy fit? What does it explain well? Does it hide anything? Can you think of other analogies for sending tanks and battleships to England without getting money or an immediate debt agreement? Discuss some other possible analogies. (One example might be two different cities, and one has a lot of fires but not enough fire trucks. Another city has many fire trucks, but very few fires, and is worried that the fires in the city nearby will spread. The city without fires wants to lend some fire trucks to the first city.) Finally, having discussed the various analogies you've created, consider what President Roosevelt was trying to convey with his garden hose analogy. Activity 2. FDR's Fireside Chat on the "Arsenal of Democracy"
Students can access this activity through a Launchpad. Distribute the edited version of the "Arsenal of Democracy" Fireside Chat, Address of the President Delivered by Radio From the White House, December 29, 1940, 9:30pm, provided as a PDF. Optional step: You may wish to play an audio file of FDR delivering a portion of the speech. Access it from a list of Audio Clips on this page from the FDR Presidential Library, a link from the EDSITEment-reviewed American President. Have students answer the following questions, aloud or on paper, to ensure comprehension of the passage. Who threatens America and the world? Who is fighting to hold off and defeat that threat? What do the people who are defending themselves ask of the United States? How can the United States aid the defenders of Democracy? Why should management and labor get along without strikes or lockouts? Who will decide if the production of consumer or luxury goods needs to yield to defense production? What alternative does Roosevelt pose to arming Britain and other democracies? Have students make a list of all the things America will do. Once their lists are complete, they should mark any item on the list that suggests an expansion of federal power with an E. When they've finished, they should look back over the speech, and see if any words or phrases not on their list suggest an expansion of power—they should mark those with an E in the margins of the paper. Students will use these notes in the discussion in the next step. Lead your students in a conversation about what it meant for America to become the "Arsenal of Democracy." What role would America play in the world? What would this role mean for Americans in general? For workers? For factory owners? For consumers? Have students speculate on what it would cost to become the arsenal of democracy and who would pay for it. During the conversation, you may wish to draw out the implications of Roosevelt's speech for an expansion of federal power in terms of demanding the production of weapons rather than consumer goods, setting prices, ensuring labor disputes did not disrupt production, and in allocating weapons to different nations. Students can download this activity as a PDF. Tell students that they are about to look at photographs taken to document and promote the Lend-Lease program. The purpose of looking at these photographs is to better understand what this $50 billion program bought, what it meant to America's allies, and finally to contemplate what control of Lend-Lease meant in terms of the power of the Roosevelt administration and the executive branch. Have students brainstorm about what kinds of images they might encounter in such photographs, and where such photographs would be taken. (Answers might be: images of guns, ships or planes, located in Britain). Tell the students that the decisions about how much aid to provide, what kind of materials to provide, and which countries would receive the aid were all made by the President or his advisors. Now have students work in groups to investigate these images (listed below). They should write a sentence or two for each photograph, saying what the U.S. is "lending," who is receiving this "loan," and explaining how this might help the Allies win the war. NOTE: All of these photographs were taken by the Farm Service Administration/Office of War Information photography unit. Some are images that can be directly linked, and some require a search on the main photo collection website. The directly linked images have captions written by historians for a web-exhibit, while the searched images have the original captions. The photographs with the captions that appear below them. 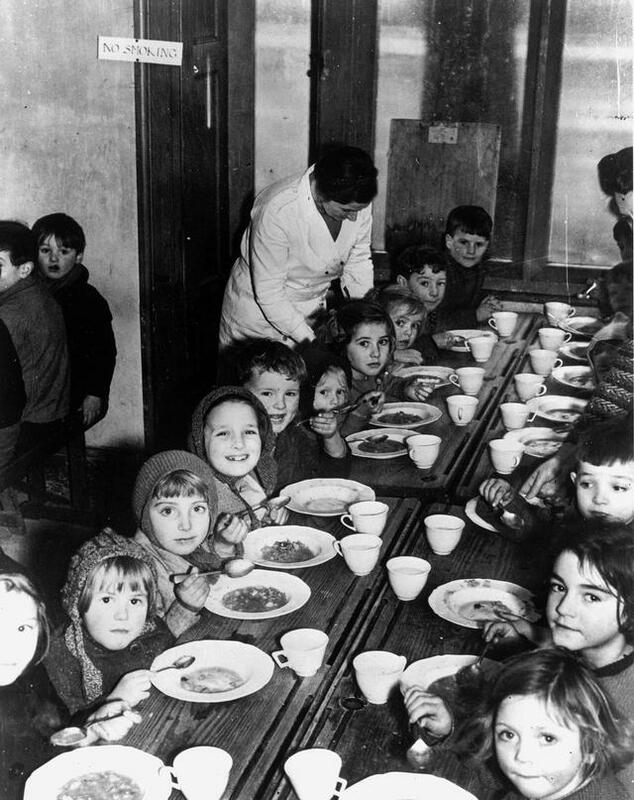 "In this photograph, shot in December 1941, British children, evacuated from London's East End, are receiving a meal made from American dehydrated vegetables, provided under the Lend Lease program." "This photograph taken in the summer of 1941, shows Churchill's recognizable figure as he watches the arrival of the first B-17 'Flying Fortress.' Even though the U.S. was desperately trying to build up its military forces throughout 1941, Roosevelt decided to give the British models of the United States' most advanced weapons. Military aid to Britain was greatly facilitated by the Lend-Lease Act of March 11, 1941, in which Congress authorized the sale, lease, transfer, or exchange of arms and supplies to 'any country whose defense the president deems vital to the defense of the United States.'" "Baby Betty Rothwell loves her orange juice. She was very thin and ailing until lend-lease concentrated orange juice arrived in England for special distribution to children, nursing mothers and invalids. With the juice added to her wartime diet, she soon became the healthy one-year-old in the photograph." This is the search page for the FSA/OWI black and white photographs. Type in M. Maisky to find this image. The image may be a British photograph transferred to the Office of War Information. "Crowds of people and a guard of honor of tanks, meeting M. Maisky, Soviet ambassador, and members of the Russian military mission when they arrived at a tank factory somewhere in Great Britain(? ), where the week's tank production is for Russia, showing the "Stalin" tank, which had just been christened by Madame Maisky." Lead students in a discussion of the images, particularly the evidence they noted on how the different types of U.S. aid could help the Allies win the war. Conclude by asking students how these images compare to the program announced by Roosevelt in his fireside chat. Direct students to go to the American Memory site and search all FSA/OWI photographs. Tell them to type "Lend-Lease" and they will see a list of photographs (100 as of 2006). Have each student choose one new photograph from the collection. They can write a caption for the photograph explaining what aspect of the Lend-Lease program it illustrates, and how this represents an extension of power for the president and the U.S. government. More advanced students may link their photographs to a quotation of their choice from the Vandenberg letter or the FDR speeches used in this lesson. Their caption should explain how the visual evidence in the photograph links to the specific quotation from the document they have chosen. If you're comfortable assigning your students to do some additional research, you can ask students to choose a photo from the FSA/OWI collection on the American Memory site, and try to find as much information as possible about that photograph or its context. For example, students might find a photo from India or China, and drawing on other sources, describe America's relationship with this part of Asia during the period depicted in the photographs. In this lesson, students gain a sense of the dramatic effect of FDR's voice on his audience, see the scope of what he was proposing in these first two "Fireside Chats," and make an overall analysis of why the series of speeches were so successful. This lesson engages students in the debate over the Social Security Act that engrossed the nation during the 1930s. The Civilian Conservation Corps, a New Deal recovery and relief program provided more than a quarter of a million young black men with jobs during the Depression. By examining primary source documents students analyze the impact of this program on race relations in America and assess the role played by the New Deal in changing them. This lesson asks students to explore the various roles that Eleanor Roosevelt a key figure in several of the most important social reform movements of the twentieth century took on, among them: First Lady, political activist for civil rights, newspaper columnist and author, and representative to the United Nations. Evaluate the domestic and international implications of America's new role as "the arsenal of democracy." How did the Lend-Lease program increase the power of the executive branch of the federal government to act in response to world affairs?